Here is another progress report on the Single Girl Quilt. The front is done !! Hurray !!! The sewing of the blocks came together quite quickly after I sorted out the upside down 'I' (see anger report about that here). The blocks are mostly flat but not entirely, nothing that a bit of ironing isn't going to sort out. I decided to stick to a 9 block sofa quilt but I have 3 blocks left as I started out with a twin in mind. So I added another one to them so I can make a baby quilt (might actually make that for the Japan Relief, let's see). Then came the agonising question about what to do for the back. When I started out sewing the front I was pretty convinced I would stick to the geometric theme for the back too, perhaps with some squares and a darker background but then I thought that this may take the whole geometric/rainbow thing a notch to far. So I decided on a brighter perhaps floral yet funky back. I went through my stash and looked at the "Coriander" print from Alexander Henry I bought sometime last year. I so love this print, it is fresh, funky, different, you name it. It deserves something really special to be paired with. So I thought I use that on my Single Girl Quilt as I am so proud of it but when I went to bed last night I got second thought about it (yes I know one should not exactly do that in bed....). 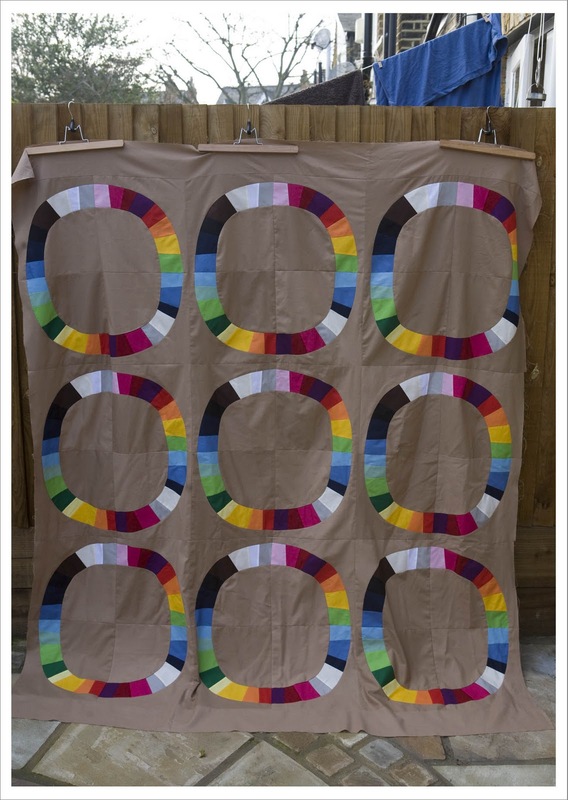 I want quilt it in straight line (like this amazing SGQ version)with fairly narrow lines with a putty coloured thread and that would not go well at all with my AH print. So when I got up this morning I had decided on another print. And this is really really bad. I have had no Echino prints in my house so far and I kinda know that if I start there will be no stopping (I am seeing this all over blogland, once you buy Echino ones you are hooked). So I ordered at eternal maker the Matrigal in Brown from the lightweight Winter collection. There, I did it and I am officially giving fair warning. I will keep harping on about Echino for forever and a day now. I just know it. 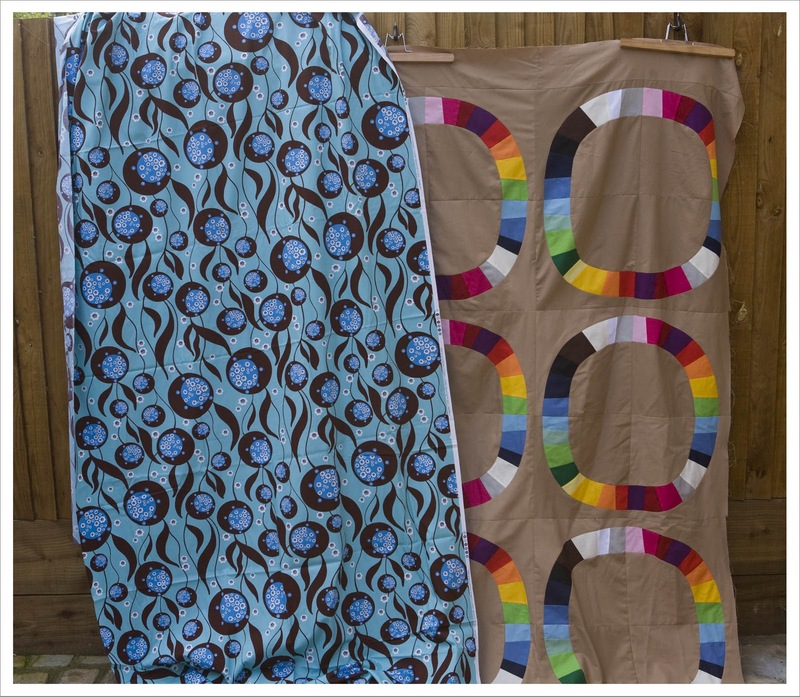 But this print really is perfect as it has a brown background that will go well with my quilting thread also turquoise, pink and a host of other bright rainbow colours that match the front very well. Can't wait to get it in the house and quilting over the weekend. amazing. i love your color choice & placement. it makes for a powerful piece. I really do love your single girl... That straight line quilting will look really cool with it too. Look forward to seeing the end result! it is beautiful! i found you from Lily's QAL on flickr. i think you are very talented! I love, love, love this! Great work.